Wheat burned by the fire in the distance after farmers saw a bountiful crop this year. The Substation Fire in Oregon quickly turned those hopes into fear, as the flames threatened wheat, livestock and homes in its way. It’s a fire that’s already destroyed homes and burned 80 square miles of wheat. Duling said the fire was so fast and furious that farmers who battled the flames couldn’t get ahead of it, mainly trying to play catch-up and save the structures and animals they could. They prioritized lives over their own crops as walls of fire up to 30 feet raged across Oregon’s farm country. Duling said he worked on a hotshot fire crew in college battling fires, and this wildfire was the worst he’d ever seen. It’s a remote area and as the fire grew quickly, it was farmers and ranchers who battled the flames. Farmers used water tanks and discs to try to control the flames, but the fire proved to be too furious, jumping the river and scorching land in the next county. It’s the wind shifts that made the fire this past week unmanageable and causing fatalities. John Ruby, 64, died trying to save his neighbor’s property. Neighbors said Ruby had a passion for growing wheat and a passion for helping people. As farmers and ranchers assess what’s left, and sift through all the damage that happened before their eyes, it’s a reality that’s not easy to grasp. 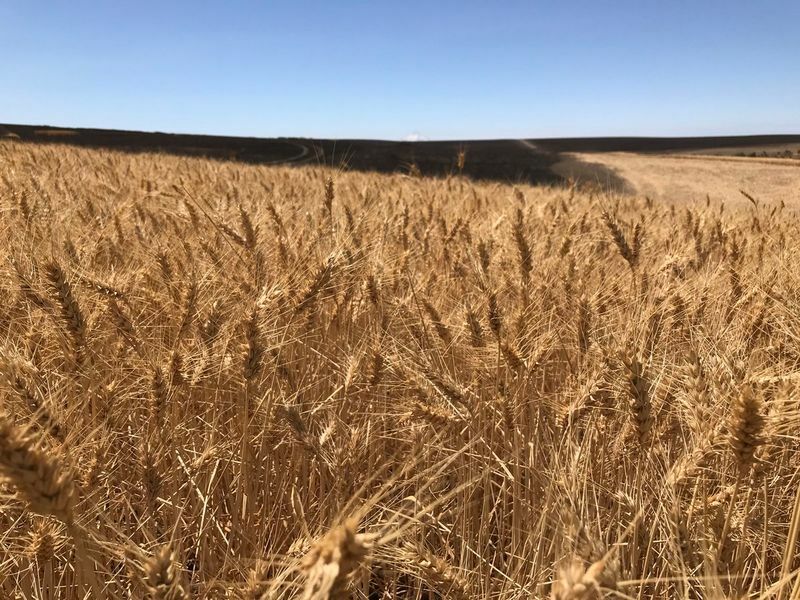 The wheat crop had the potential to be good, but is now left in ashes, as many didn’t insure to the level they were seeing this year. If the current wildfires raging in the West are any indication of what’s to come, it could be another wild wildfire season. As the U.S. Drought Monitor shows severe drought leaving scars across the West, that dryness could spark more severe wildfires in the months ahead. “Last year we had a big wildfire season in the northern Rockies. I suspect that may be a little further west this summer, because we've had our dryness cascade and points westward, which is an area of the country we don't normally think about wildfires being a big deal,” said U.S. Department of Agriculture (USDA) meteorologist Brad Rippey. Rippey said that comes on the heels of a near-record-breaking wildfire season in 2017, charring nearly 9 million acres. It was not only large, but came with a hefty price tag. The U.S. Forest Service spent $2 billion to fight the fires, setting a new record. “A couple of areas we're watching for potential drought development include the Pacific Northwest,” said Brad Rippey. The U.S. Drought monitor shows dryness currently covers nearly 94 percent of Oregon and 91 percent of Washington. Washington's drought spread 25 points in a week. It’s more severe drought currently plaguing Nevada and Colorado, where wildfires rage on. Thoughts and prayers to those that lost their wheat crop to the fire. Losing to Mother Nature is one thing, but to an arsonist...Hopefully the person is caught.